A Sark hotel and a restaurant owned by the Barclay brothers are set to reopen after more than four years. 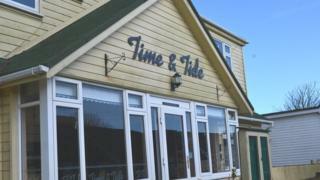 La Moinerie Hotel and Time & Tide Bistro will open this summer, Sark Estate Management confirmed. The Barclay brothers-owned company closed the hospitality firms in October 2014, due to a lack of business. Three other hotels owned by the Barclays - the Aval du Creux, Dixcart Bay, and Petit Champ - were also closed in 2014. The decision to reopen the businesses is based on the hope the island will attract more visitors directly from France, the Sark Newspaper reported. The publication, edited by Sark Estate Management's Kevin Delaney, said the reopening of the businesses was based on the island establishing a customs post. More Guernsey stories and news. In February, a petition gathered 147 signatures calling for the introduction of the post, which would allow direct ferry services to the island. "It is now only a matter of when, not if, that we get a customs post that will allow Sark's tourism sector, the island's principal economic driver, access to the vast markets of mainland Europe," the newspaper said. "Upon the introduction of a customs post, other businesses may follow," the paper added. Sark: Ten years of democracy, but is it working?